The 2018 Mitsubishi Outlander SEL is the most cost-effective way to move into a seven-seat crossover while still getting the features you want. 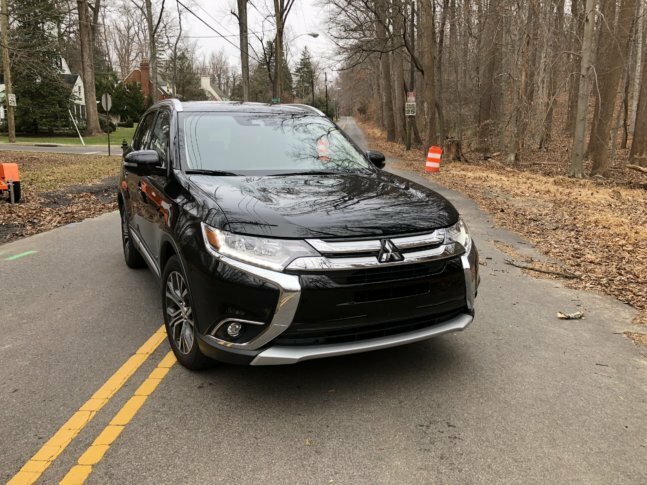 WASHINGTON — If you want a three-row crossover but don’t want to spend big bucks, the AWD Mitsubishi Outlander beats buying used or choosing the base version of a competitor without AWD. This Mitsubishi offers seating for seven and fully loaded its price is just over the $31,000 mark. The 2018 Outlander sits somewhere between the compact and midsize crossover when it comes to size. It’s a good medium for families that don’t always use the third row but have that occasional need. The first two rows are right-sized for adults with adequate head and legroom while that third row is best suited for children. The leg room for that third row isn’t for taller adults. The standard leather interior on the top-of-the-line SEL trim level is a pleasant surprise in an AWD crossover with a starting price of around $28,000. The driver and front passenger have heated seats and power controls. The comfort of the seats is decent, though it could be a bit hard on some people’s backs. The rear seat cushion seems a bit harder than some of the competition. The materials are higher quality than the last Outlander I drove a few years back and includes some soft touch materials on the dash and the arm rests this time. A loud 710-watt premium audio system can always be heard thanks to the optional SEL Touring package. Driving the Outlander is a more hushed affair this time around. There is less wind and road noise and it’s on par or better than others in its class. Visibility is also good. You can see all around the vehicle easily, plus the around-view camera system helps in parking lots. Power is where the Outlander SEL falls short. With just 166 hp, it can be a struggle to merge with traffic with five seats filled and some cargo in the back. The CVT transmission keeps the engine in power, but it does drone when accelerating. Mitsubishi also offers a V6 version that puts out more power. While the SEL isn’t flush with power, there is a big upside with the gas mileage. I managed 28.7 mpg for the week — a bit better than the 26 mpg the sticker touts. The ride is good on city streets and highways but pushing it on back roads isn’t really its cup of tea. Still, the SEL does fine at a moderate pace. Where the Outlander truly impresses is with safety items. Getting Forward Collision Mitigation, Lane Departure Warning and Adaptive Cruise for this price is a boon for drivers. The Mitsubishi Outlander SEL isn’t as aggressively styled as some other crossovers right now, but I found it to be a handsome low-key ride. Mitsubishi redid the front-end styling making more of statement than before. The LED lighting and new upper chrome grill is wide. There is also a lower grill to match the body color, which looks better than if it was all chrome. There are chrome accent pieces on the beltline, color-keyed door handles and side mirrors, which seem to be the better choice in my opinion. The SEL trim level adds large 18-inch wheels and rear privacy glass that help complete that crossover look. Silver roof rails play nicely off the Labrador Black paint and add some extra space for cargo storage, too. Out back the Outlander is bit plain, but there are some chrome trim pieces to spice it up a bit. With a 10 year/100,000-mile powertrain warranty and 5 year/60,000-mile new car warranty, Mitsubishi is selling more vehicles in America lately by offering big bang for your buying dollar. Mike Parris is a member of the Washington Automotive Press Association. The vehicles are provided by STI, FMI or Event Solutions for the purpose of this review.